‘But America, you’re not Mexican,’ Dunham pointed out. ‘And President Obama isn’t Kenyan, Lena, but that doesn’t stop Donald,’ Ferrera shot back. ‘The unfunny fact is that this man would have you believe that our differences are more important than what unites us,’Dunham said. ‘When we know that the truth is that this country was founded on the belief that what sets us apart – race, language, religion, sexual orientation – should not dissolve what binds us,’ Ferrera finished. 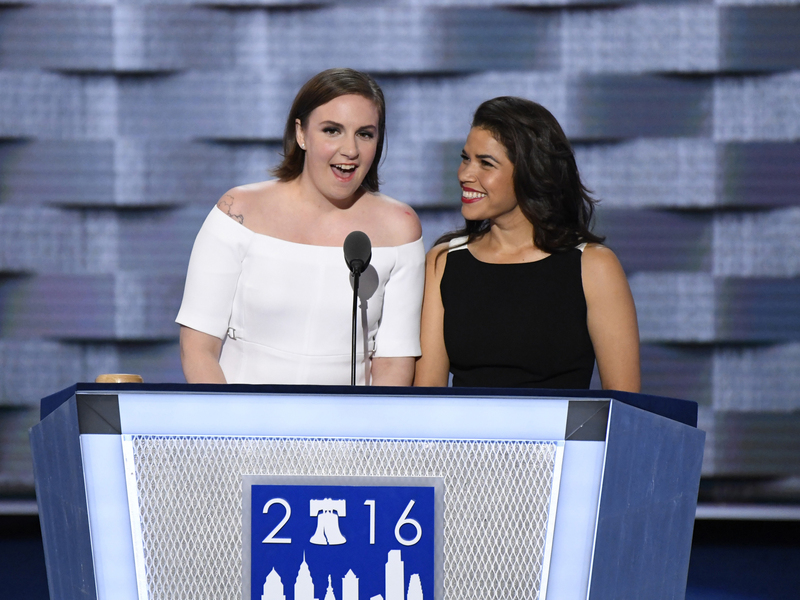 ‘Which is why we are proud to say,’ Dunham began – ‘We’re with Hillary,’ the two actresses said in unison. Ferrera, her voice rising and breaking, recalled her upbringing as the proud child of Honduran immigrants, who went to public schools. ‘And you know what? Occasionally, I needed a free meal to get through the school day. Not everybody looks at the millions of young people like me – children born into struggling families, children born to immigrant parents, children who are immigrants themselves – not everybody looks at them and sees an investment.’ But Hillary does, Ferrara said. ‘Luckily, we the voters carry the future of this country. We don’t accept hatred as the norm in our communities. So why would we ever accept it in the Oval Office?’ Dunham concluded to cheers from the crowd. Both actresses have been vocal supporters of Clinton’s candidacy throughout the election. In addition to stumping separately for Clinton on the campaign trail, Dunham and Ferrera also co-hosted a private event for the former secretary of state in Hollywood in March. In the hours leading up to her speech on Tuesday, Dunham posted several photos from the convention on her Instagram – including a selfie with two Bernie Sanders delegates who are transgender, and a sneaky shot of Jerry Springer and a Clinton delegate. 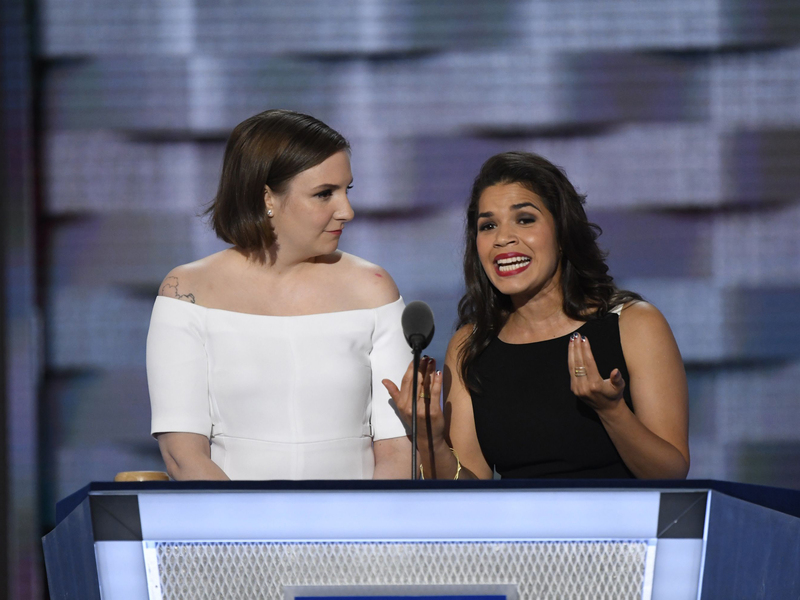 Last week, Dunham posted a photo of herself with co-speaker Ferrera, captioning it: My soul sister @americaferrera and I are headed to the Democratic National Convention to speak as a team in support of @hillaryclinton. The honor! The thrill! We promise not to copy off Michelle Obama’s homework, dreamy as she is #imwithher.